Healthy Mouth, Healthy Life! : Why Do We Take Digital Dental X-Rays? 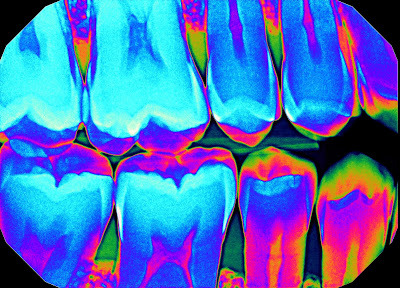 Why Do We Take Digital Dental X-Rays? 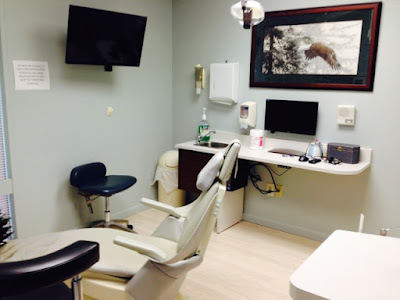 Why Has CrossKeys Dental Transitioned to Digital X-Ray Technology? Color enhancement made possible with digital technology helps your dentist with diagnosis. Most of you have already experienced the new state of the art imaging systems we employ in our practice at CrossKeys Dental in Fairport, NY. Many of us are old enough to remember having the dental staff put little film packets in our mouth and take pictures that the dentist would look at to detect cavities and other problems. From those tiny films, the diagnosis and treatment decisions were decided upon. Now, the images are displayed on a huge monitor where we can all see them together and share in the decisions. That alone is worth the change from film to digital systems, but there is much more. We can now enhance the images, magnify them, highlight areas of concern, make measurements, send images directly to specialists while you are still there for consultations, and even use the images to help with your insurance claims. Due to the high sensitivity of the newest capture devices that have taken the place of the film we can now render images using far less radiation than was necessary to properly expose the film that was previously used. Both Dr. Badali and I believe that proper diagnosis is possibly the most important thing we do for the people who entrust their care to us. The quality and the precision of the images we now have makes an accurate diagnosis more possible than ever before. If you have seen these images for yourself, you can attest to the remarkable level of detail we now have at our disposal. We continue to train our staff regularly on proper technique for capturing and interpretation of the images. We call our method "Co-Diagnosis." This involves participation of the doctors, the staff and the patients themselves, all looking at, and making decisions regarding what is displayed on the monitors. In the process, the patient becomes much more educated about their own body and how they can take steps to maintain it in optimum health. Being able to show you the images first hand allows us to take time to teach you how to examine the images and what all the detail means. One of the most important things you will soon realize is how relevant areas other than the teeth are. We carefully examine all of the bony areas of the head and neck in order to detect anything unusual which may be the beginning of something much more serious than tooth decay. You can see the details yourself as we point out the anatomical landmarks, so you know what is considered normal and what is not. Our favorite thing to tell our patients is that there is nothing on their X-ray study that is out of the ordinary. However, you can imagine how powerful the information is if we do in fact see something. We all know that as we age, things happen and that early diagnosis is the key to successful treatment. Just as important as the other tests that we all go through, such as colonoscopy, mammogram, blood tests, etc, a properly exposed and carefully evaluated dental X-ray scan could not only find cavities, it could actually save your life! One of the operatories at CrossKeys Dental with the patient's HD monitor on display. So for those of you who have already seen the system in action, I think you will agree that times have changed. For those who have not, we invite you to inquire of anyone on our staff about it. We have made it a priority to update our patient's charts using all available state of the art diagnostics so we will probably bring this topic up with you at your next cleaning appointment. If you wish to have a full series done prior to that time, please call our office and we will be happy to do so. We will provide you with both the images as well as some time with one of the doctors to review the scan with you. What Exactly is a Dental Cavity?